His Opposition to Secular Sciences. Head of the yeshibah of Volozhin, Russia; born at Mir, in the government of Minsk, in 1817; died at Warsaw Aug. 10, 1893. In 1831 Berlin, who was a descendant of a scholarly family, married the daughter of Isaac b. Ḥayyim, the head of the Volozhin yeshibah. After the death of Isaac in 1851 his elder son-in-law, Eliezer Isaac, became principal, and on the death of the latter in 1854, Berlin succeeded him. He followed the path of learning laid out by Ḥayyim, the founder of the yeshibah, according to the plans of Elijah of Wilna; viz., plain logical reasoning, instead of employing the Pilpul. A minority of the yeshibah students who cultivated a taste for pilpul seceded and elected as their principal Joseph Baer Soloweitchik, well known as an acute pilpulist and a grandson of Rabbi Isaac. This division created discord between the students of the two factions; and the Russian rabbis sent a delegation to Volozhin to investigate the matter. They quelled the disturbance and established a union headed by Berlin, who was installed as the one head of the yeshibah. Berlin's whole life was devoted to the welfare of the yeshibah, and all his energy was directed toward increasing the number of the students, and caring for their support and comfort. He appointed and sent authorized agents ("meshullaḥim") to different parts of the world for voluntary contributions to assist in maintaining the yeshibah. A large share of the income came from America. Under his guidance the number of the students increased from 100 to over 400; and he also erected a three-story brick building with rooms for study and a library. However, the "Maskilim," who then advocated the Semi-Reform movement in Russia, opposed the yeshibah on general principles, and demanded the introduction of secular science and modern method of teaching. In answer to their demand Berlin wrote an open letter to the editor of "Ha-Meliẓ" (No. ix., 1885), explaining his standpoint. He called attention to the failure of the rabbinical seminaries in Germany, and even those of Russia, to produce a single Talmudic rabbi in the full sense of the term; while such rabbis from the Volozhin graduates were numerous. This reply did not satisfy the Maskilim, who advocated the abolition of the yeshibah as a dangerous institution and as being an obstacle in the way of general education to the rising generation. 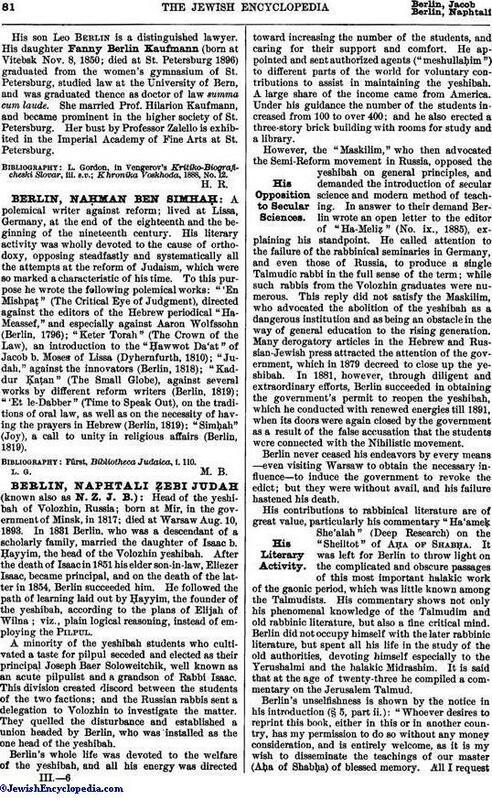 Many derogatory articles in the Hebrew and Russian-Jewish press attracted the attention of the government, which in 1879 decreed to close up the yeshibah. In 1881, however, through diligent and extraordinary efforts, Berlin succeeded in obtaining the government's permit to reopen the yeshibah, which he conducted with renewed energies till 1891, when its doors were again closed by the government as a result of the false accusation that the students were connected with the Nihilistic movement. Berlin never ceased his endeavors by every means—even visiting Warsaw to obtain the necessary influence—to induce the government to revoke the edict; but they were without avail, and his failure hastened his death. His contributions to rabbinical literature are of great value, particularly his commentary "Ha'ameḳ She'alah" (Deep Research) on the "Sheiltot" of Aḥa of Shabḥa. It was left for Berlin to throw light on the complicated and obscure passages of this most important halakic work of the gaonic period, which was little known among the Talmudists. His commentary shows not only his phenomenal knowledge of the Talmudim and old rabbinic literature, but also a fine critical mind. Berlin did not occupy himself with the later rabbinic literature, but spent all his life in the study of the old authorities, devoting himself especially to the Yerushalmi and the halakic Midrashim. It is said that at the age of twenty-three he compiled a commentary on the Jerusalem Talmud. Berlin's unselfishness is shown by the notice in his introduction (§ 5, part ii. ): "Whoever desires to reprint this book, either in this or in another country, has my permission to do so without any money consideration, and is entirely welcome, as it is my wish to disseminate the teachings of our master (Aḥa of Shabḥa) of blessed memory. All I requestof the publisher, if he does so during the lifetime of myself, or my son Ḥayyim Berlin, is that he will notify either of us, in order that I or my son may add, amend, or correct the style or rearrange the matter." 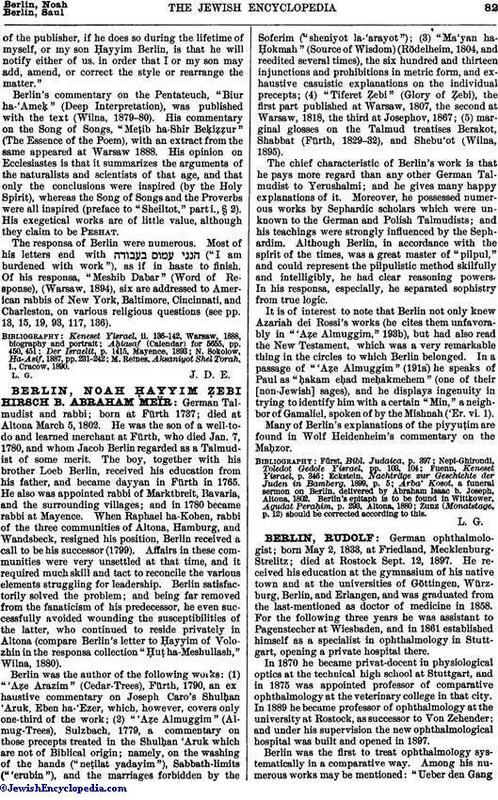 Berlin's commentary on the Pentateuch, "Biur ha-'Ameḳ" (Deep Interpretation), was published with the text (Wilna, 1879-80). His commentary on the Song of Songs, "Meṭib ha-Shir Beḳiẓẓur" (The Essence of the Poem), with an extract from the same appeared at Warsaw 1888. His opinion on Ecclesiastes is that it summarizes the arguments of the naturalists and scientists of that age, and that only the conclusions were inspired (by the Holy Spirit), whereas the Song of Songs and the Proverbs were all inspired (preface to "Sheiltot," part i., § 2). His exegetical works are of little value, although they claim to be Peshat. The responsa of Berlin were numerous. Most of his letters end with ("I am burdened with work"), as if in haste to finish. Of his responsa, "Meshib Dabar" (Word of Response), (Warsaw, 1894), six are addressed to American rabbis of New York, Baltimore, Cincinnati, and Charleston, on various religious questions (see pp. 13, 15, 19, 93, 117, 136). M. Reines, Aksaniyot Shel Torah, i., Cracow, 1890. L. G. J. D. E.